Albuquerque Beer Scene: Happy 10th, Ruination! And now we can finalllly celebrate it! The Stone Brewing Co.'s Ruination Tenth Anniversary IPA has been rolling out since June 11, though it hadn't been available in Albuquerque until yesterday. I'm not going to go on a rant about that, though, because I just got back from San Diego and the beer was surprisingly scarce considering how close I was to the source. I'm just happy we can get it here- had it on tap at Stone and it is really something...not surprising, seeing that the Columbus and Centennial hop bill was upped from 2.5 to FIVE pounds per barrel! Then Greg Koch's voice boomed down from above (sounding strangely like Charlton Heston's), "Let there be dry hopping! ", and Mitch Steele was quick to add a pound each of Centennial and Citra. 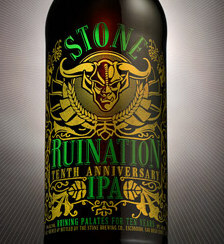 The final result brings the 10th Anniversary Ruination to 10.8% ABV (up from the regular Ruination's 7.7%). Jubilation has this one right now, and I know plenty of others did not get it so call your local before heading out to buy.